Published: January 2019 - Bloomsbury. Triggers/Content Advisory: Violence / mild sexual innuendoes. Source: ARC gift from the author. Fall in love, break the curse. It once seemed so easy to Prince Rhen, the heir to Emberfall. Cursed by a powerful enchantress to repeat the autumn of his eighteenth year over and over, he knew he could be saved if a girl fell for him. But that was before he learned that at the end of each autumn, he would turn into a vicious beast hell-bent on destruction. That was before he destroyed his castle, his family, and every last shred of hope. Nothing has ever been easy for Harper Lacy. With her father long gone, her mother dying, and her brother barely holding their family together while constantly underestimating her because of her cerebral palsy, she learned to be tough enough to survive. But when she tries to save someone else on the streets of Washington, DC, she’s instead somehow sucked into Rhen’s cursed world. Break the curse, save the kingdom. A prince? A monster? A curse? Harper doesn’t know where she is or what to believe. But as she spends time with Rhen in this enchanted land, she begins to understand what’s at stake. And as Rhen realizes Harper is not just another girl to charm, his hope comes flooding back. But powerful forces are standing against Emberfall . . . and it will take more than a broken curse to save Harper, Rhen, and his people from utter ruin. MY HYPE OVER THIS BOOK HAS BEEN INSANE. Ever since Letters to the Lost, I've been obsessed with Brigid Kemmerer's books. When I heard that this novel was a FAIRYTALE RETELLING, I didn't think it could get any more perfect. Kemmerer's writing is amazing. I absolutely love her style. The story is very much a fairytale, and I love how magical everything is. It really is like a tribute to classic, old-fashioned fantasy movies from years ago. It has that atmosphere and tone. It's beautifully nostalgic with all the well-loved elements. That said, it isn't particularly original. It's unique in the way that it twists Beauty and the Beast, but not unique in the way that it falls into the typical, vaguely medieval castle kingdom with a girl and a prince at odds. We've all seen that before. The setting certainly isn't inspired. It might be new for Beauty and the Beast, but it's not new otherwise. However, Kemmerer is an excellent writer. And while there's nothing especially amazing about the world or the premise, she gives it that magical element that makes it lovable. You enjoy it, you're carried along by it, and you're entertained. It's pure fun. At least it's well written fun. And it's escapism. If you're wanting to get lost in a world and characters, read this book. The story is definitely exciting. The pace is fast, and it's easy to read. I only wish there'd been more action. While it isn't boring by any means, there were times while reading that I thought the author could've gone a different direction with some incidents and scenes. When she didn't, they ended up a bit anticlimactic. I was disappointed by that. ❝ I stay close to Rhen and keep my voice low. “Do people always do everything you want?" The characters are all so brave and feisty. Harper is so determined not to be a damsel in distress, and I love how after immediately coming to Emberfall she's escaping out her bedroom window. She's furious at the injustice of being taken against her will and she fights it every step of the way. I love that she doesn't just swoon and accept the circumstances. I'm also so impressed by the cerebral palsy rep. Harper's chronic condition doesn't define her - I love how that's clear. Rhen is a darling character, too. He's so haunted and sacrificial, and at the same time fits the swoony prince profile perfectly ;) I loved him. His bromance with Grey, the stoic guard with a soft heart, is also really beautiful, and Grey's friendship with Harper is lovely, too. There's a real mutual respect there. It's so healthy. Beauty and the Beast is actually my least favourite fairytale. Personally, I think it gets a lot of undeserved hype. 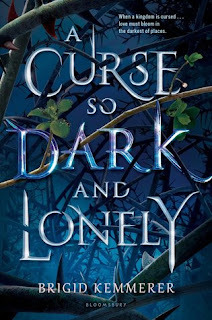 As a result, I was really hesitant - and interested - to how Brigid Kemmerer tackled it and whether she'd fall prey to the story's negative connotations (the reasons I dislike it so much); primarily, the underlying Stockholm Syndrome theme and the implication that Bella is obligated to save the Beast and stick with him despite his issues and violent behaviour. BUT GUESS WHAT. Kemmerer saves the story - and the romantic relationship between Harper and Rhen - from becoming anything of the sort. It's kinda hard to explain because you really need to read the book to see the character interactions, dialogue, and general character motivations that steer it away from any disturbing connotations, but in a nutshell: Harper isn't afraid to call out the whole situation and she's in no way submissive and obliging. She knows the initial situation is unfair and creepy, and she doesn't forget it. Harper's relationship with Rhen is beautiful. The romance is slow-burning, and their banter is precious. 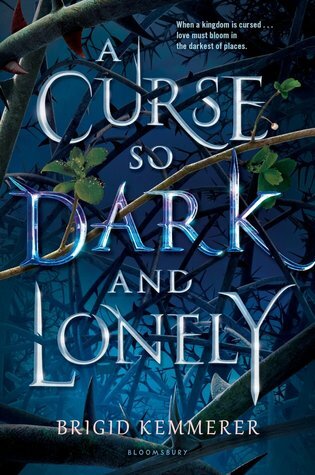 A Curse So Dark and Lonely is a wonderfully written fairytale story shining with delightful, strong characters and beautiful relationships. The unoriginality is disappointing, but the book is still a solid, swoony fantasy romance. My Top 5 Movies of 2018! My Top 5 Books Of 2018! The Bargain Books Warehouse Sale! Book Tag: Greek Gods Book Tag!